This was such a fun set for me to play with. I got to use some new techniques that I learned from creativation. Ink blending is by far one of my favorite ‘texhniques’. For this card I used Catherine Poolers Grape Crush & Be Mine inks with my Tim Holt blender brushes. One thing I will point out about this princess though, is the amount of detail. She was so fun to color! The entire Kindred Stamps February release will be available Friday, February 22nd at 8am PST/11am EST. Be sure to check out the Kindred Stamps blog on Friday for the full product release as well as the complete line up of all the Kindred Stamps Design Team projects from release week! 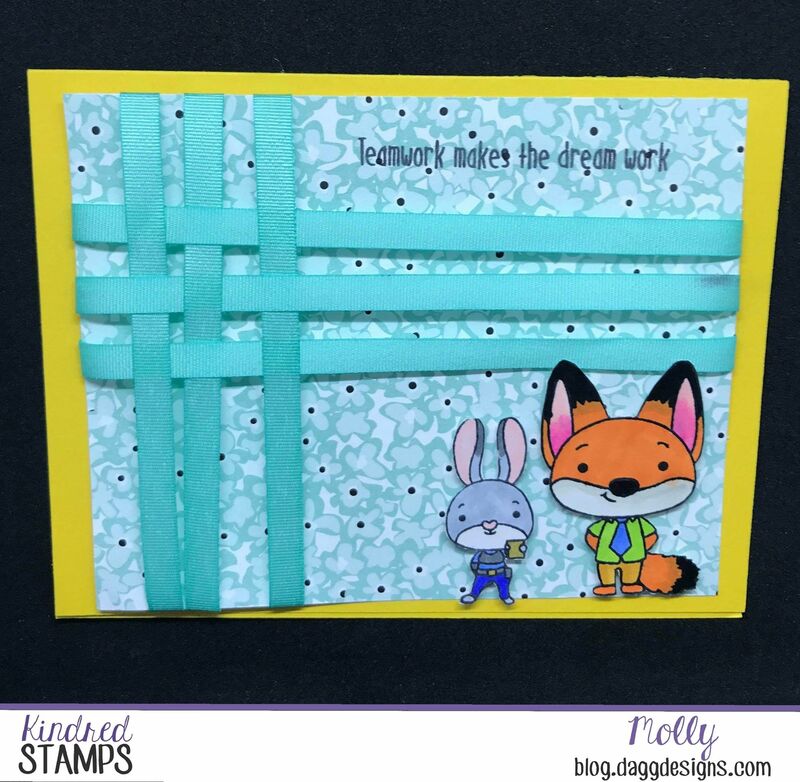 If you visit and comment on all of the designers’ blogs this week, you could win $15 in Kindred Stamps shop credit! So join the Fan Club and release event, show the design team some love, and get ready to empty those wallets this Friday! For this stamp release I wanted to try something other than cards. 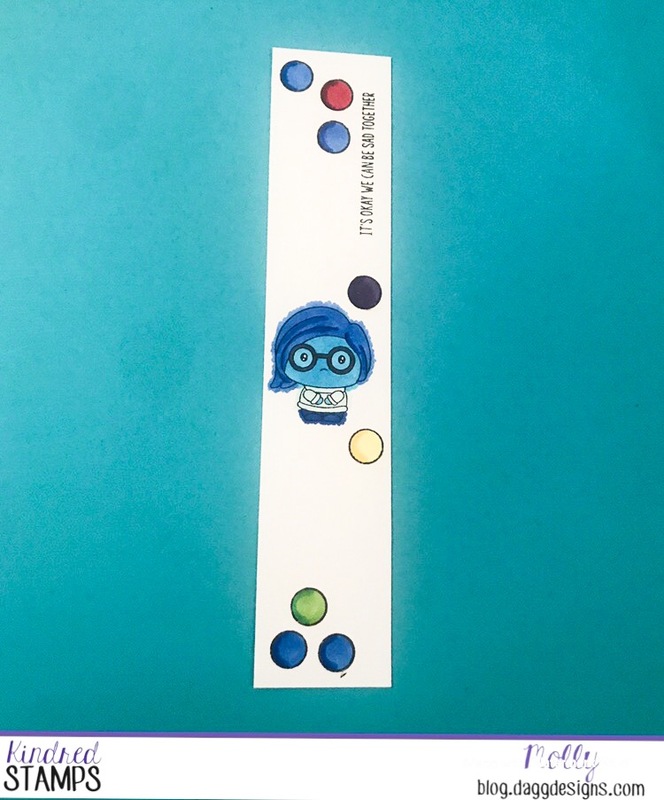 I got the idea to make bookmarks because of how much reading my friend does in their spare time. 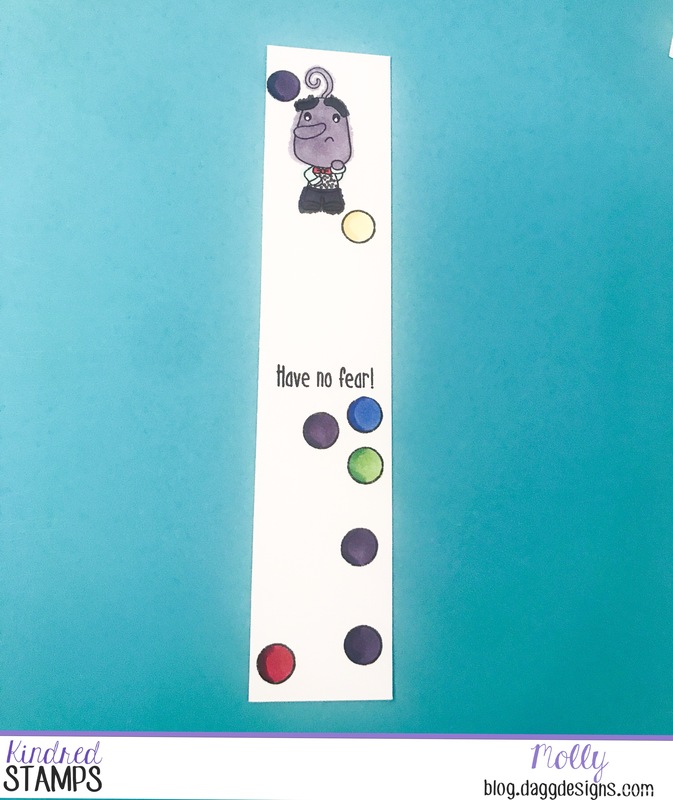 These bookmarks were so fun and simple to make, I plan on making several more! The stamp set I used was ‘Size Doesn’t Matter’ and I am very excited to show off the new set and what I made today! 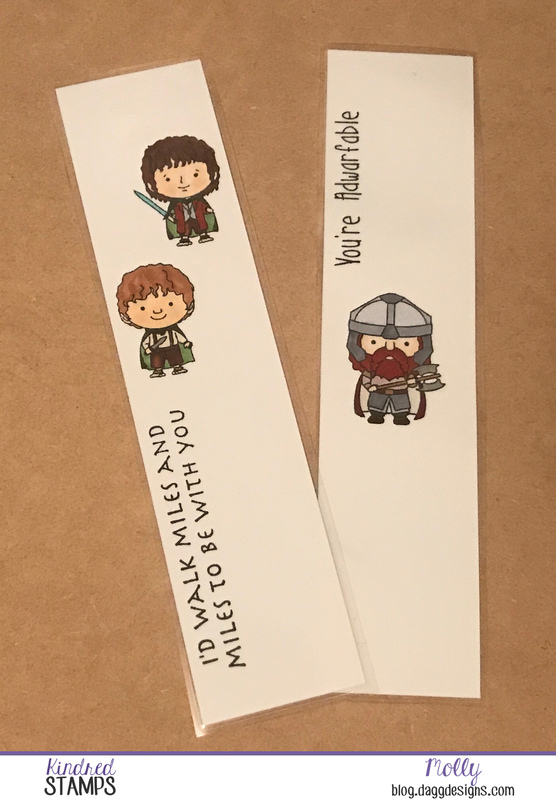 For my first bookmarks I decided to keep the background simple and white (maybe next time I will get more adventurous with the background). This lets the characters and sentiments pop more. 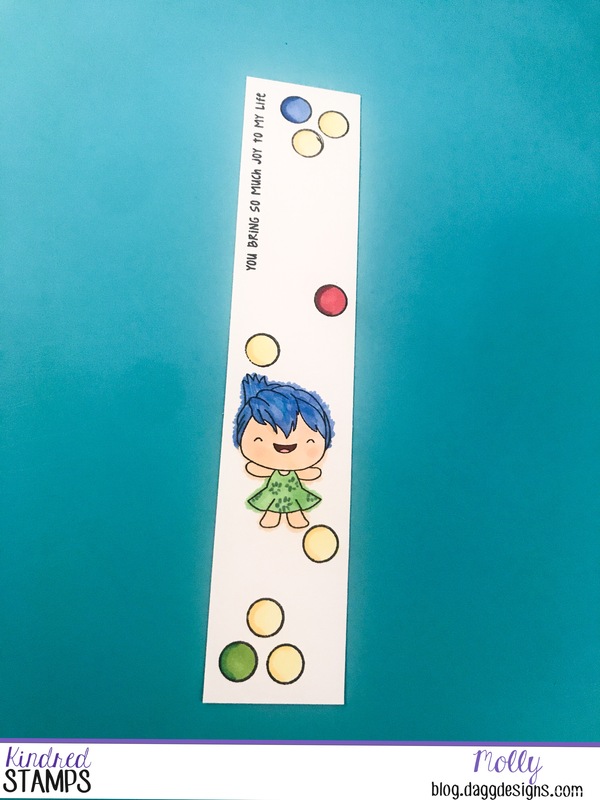 To make the bookmark I took a normal 8 1/2″ x 11″ sheet of 80 lb Neenah paper and cut it into 5 81/2″ x 2″ bookmarks. I picked out a character then found a sentiment that I liked related to each character. 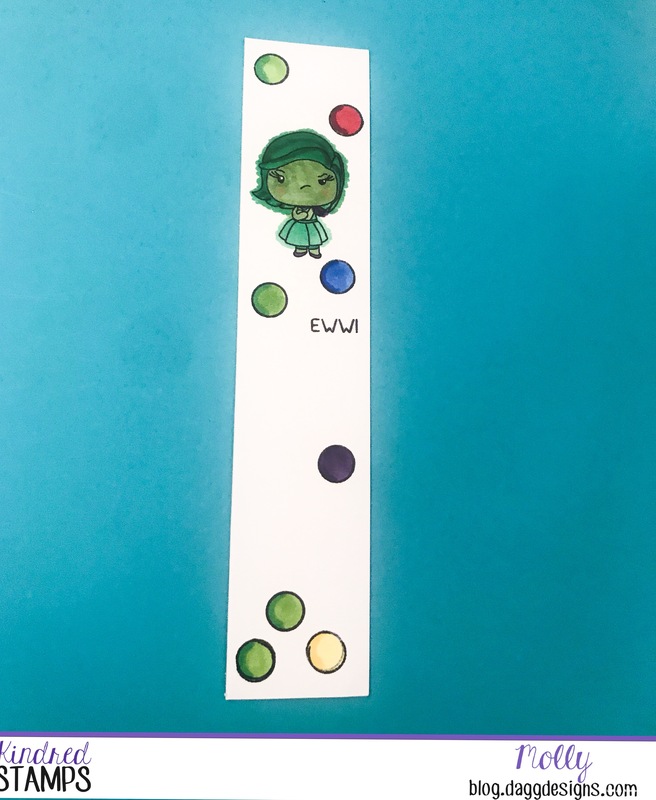 After coloring in the characters I decided to laminate the bookmark then cut it out. This will help it last over the years of being used in books and tossed in a bag. Welcome to my blog! I can’t believe December is already here. December means more new stamps from Kindred Stamps, this time its ‘All The Feels’. All of these guys deserved a little spot light. 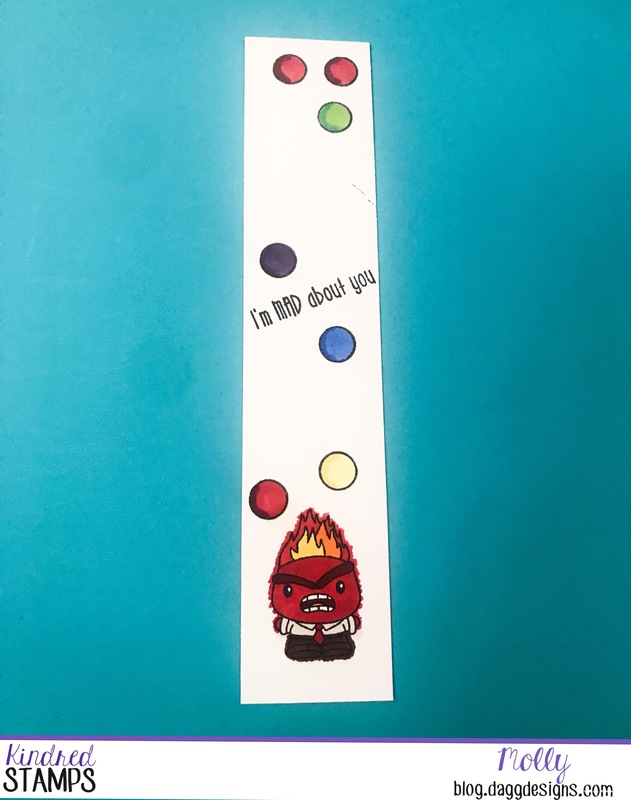 I put together a set of bookmarks. One for each character. This project was so fun and a time I could intentionally color outside the lines. The entire Kindred Stamps December release will be available Friday, December 14th at 8am PST/11am EST. Be sure to check out the Kindred Stamps blog on Friday for the full product release as well as the complete line up of all the Kindred Stamps Design Team projects from release week! If you visit and comment on all of the designers’ blogs this week, you could win $15 in Kindred Stamps shop credit! So join the Fan Club and release event, show the design team some love, and get ready to empty those wallets this Friday! On your next stop around the world, we are swinging by the islands of Hawaii! This collaboration has been so fun! 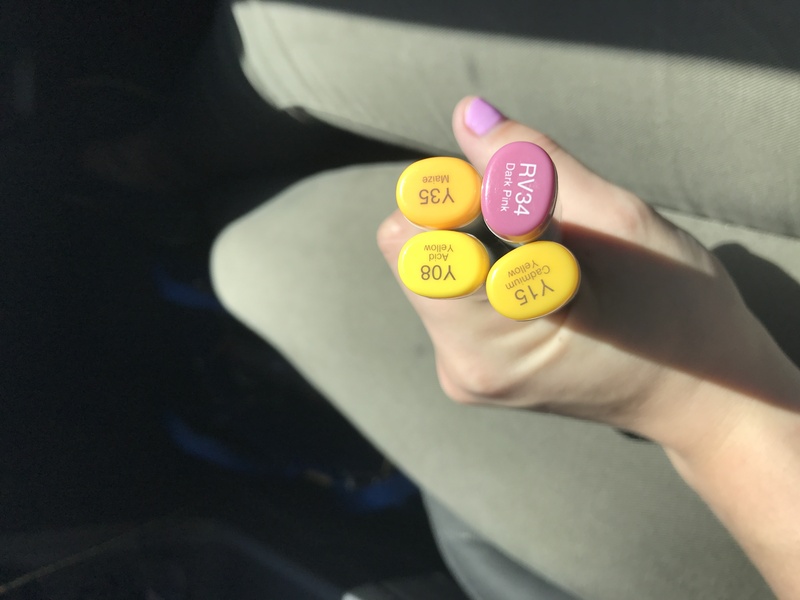 I love the two sets I was given to mix and match. 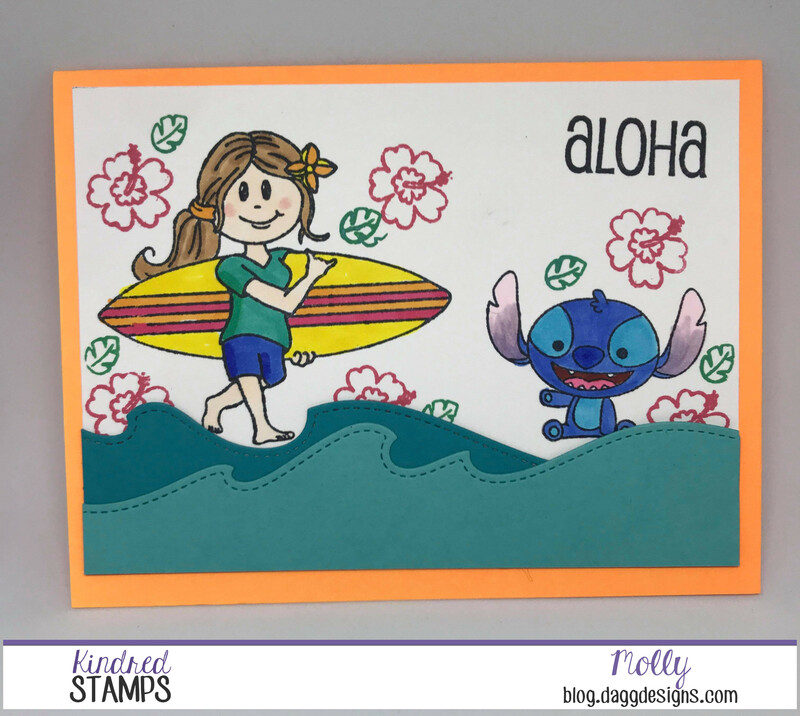 I used ‘Adventures Abroad: Hawaii’ from Beth Duff Designs & Family is Forever from Kindred Stamps. It’s very rare that I use colored inks, but this project made incorporating them easily with the red ink for the flowers and green for the leafs. I also used my wave dies from Lawn Fawn for the first time. Layering the waves with different shades of blue gave these first couple cards the detail they needed. These are only slightly different. Die cuts seem to be a common theme with these sets. I used two slightly different styles of squares and gave them some ‘pop’ with double sided foam tape. I wanted the cards to still be water themed but wanted them to be different. 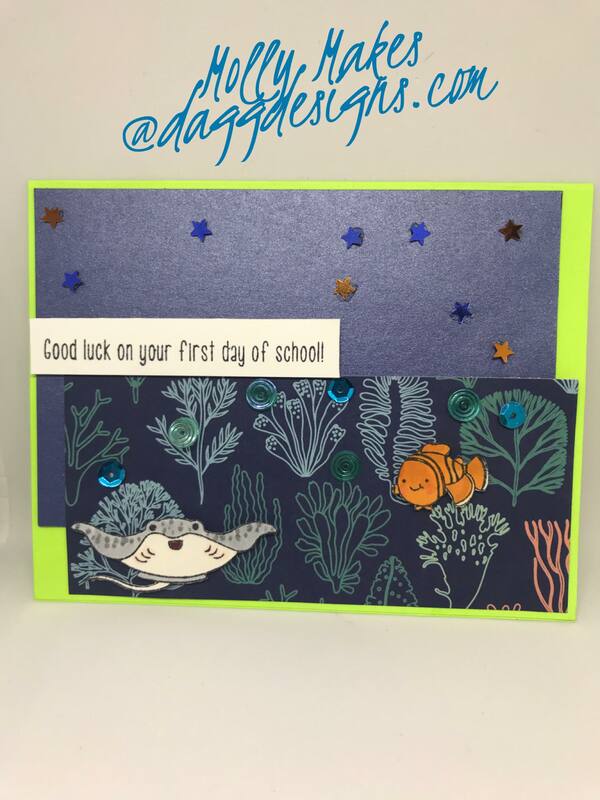 For the first card I picked a fish background and the second one is more of a coral reef background. Again, another variation of the previous card. 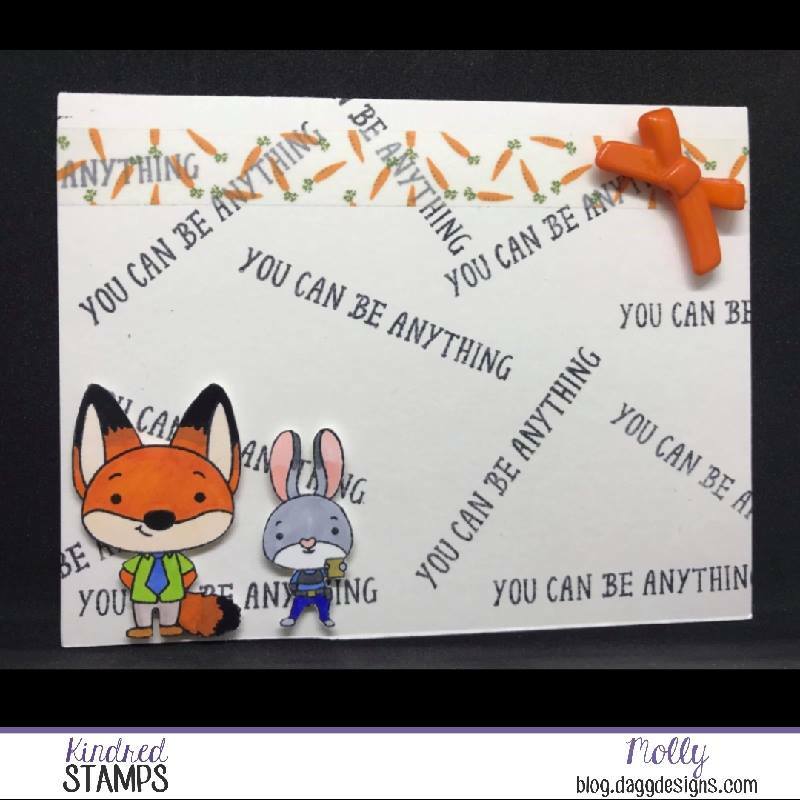 Thank you for joining us on the Kindred Stamps/Beth Duff Designs collaboration hop! We hope you’ve enjoyed the pairing of these sets. For joining us, we have a little gift for you! Kindred Stamps has a free digital downloadable passport available. 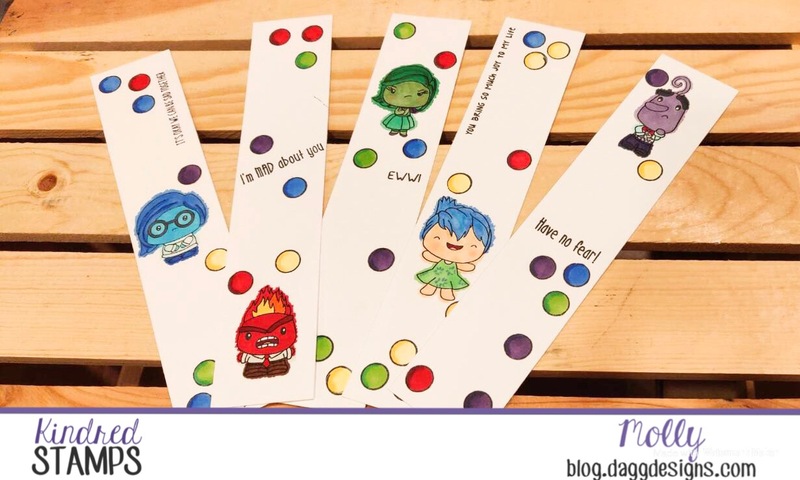 Then you will want to visit each blog on this hop, download the free digi, color it, add it your passport, and submit it to the album in the Kindred Stamps Fan Club and Unicorn Crafts Facebook groups to be entered into our giveaways! Each company will be hosting a different giveaway. The opportunity to play will end December 30th for each company! I am pretty darn excited for this new Kindred Stamps set, “Stay Wild”. 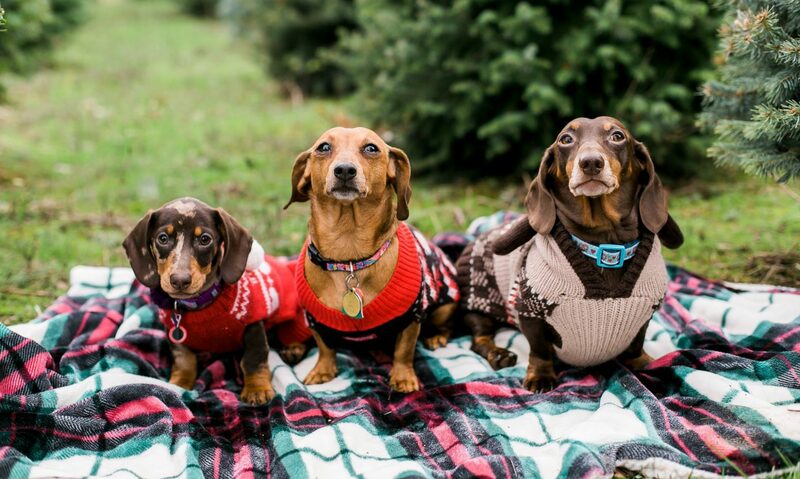 I had themed my one year anniversary photo session after two little fur balls a lot like these! My best friend, and fellow Kindred Stamps Creative Team member has been encouraging me to step out of my comfort zone with my card designs. I spent hours on Pinterest, Instagram, YouTube and even bought a bunch of new crafty stuff… that I have NO IDEA how to use. For the first card, I stepped away from the very busy scrapbooking paper that I usually use (which I am sure Rachel is still pleasantly surprised by) and made my own background instead. 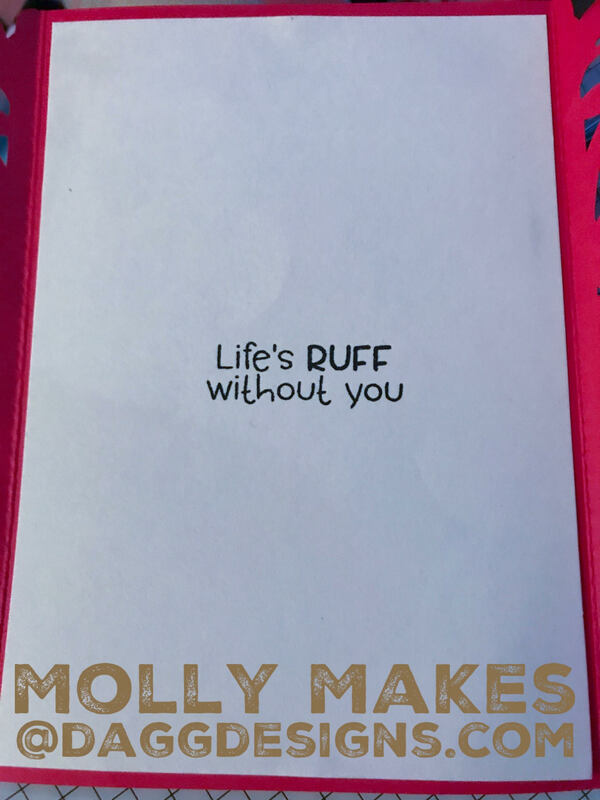 No worries, scrapbooking paper is incorporated in one of my other cards…HAHA. 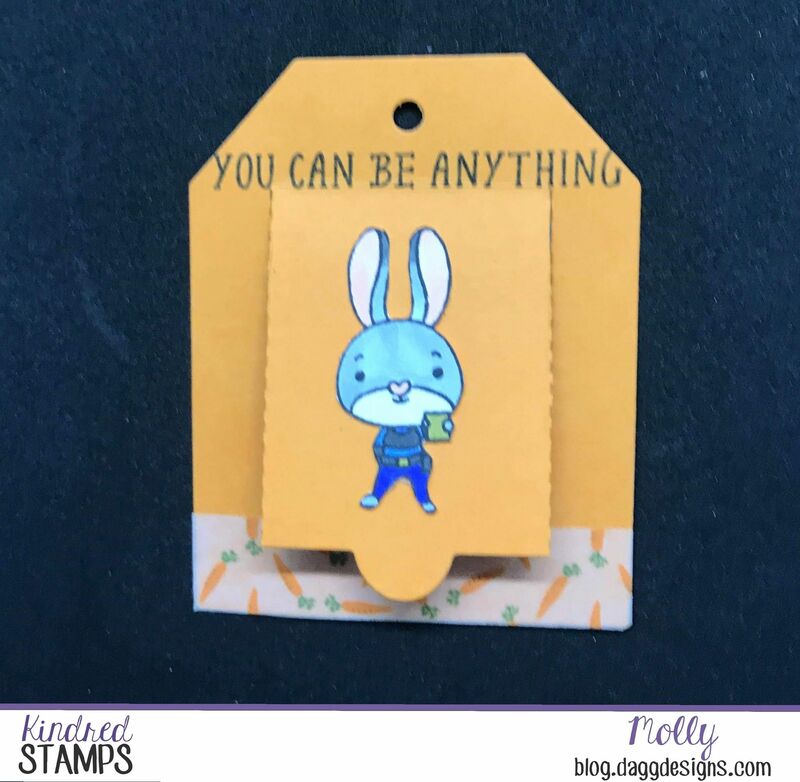 For this background though, I used an acrylic block and hand stamped the sentiment “you can be anything” just randomly in different directions. I finished the card off with this pair of furry friends, a strip of carrot washi tape, and a cute orange bow embellishment. Next, I created a few tags! When making these tags I knew I had the perfect washi tape to use: carrots (which, by the way, hubby had told me I would never use). However, I freaked out because I couldn’t find my it anywhere for several days, but ended up finding it just in time for pictures! I was SO excited to incorporate into this project. 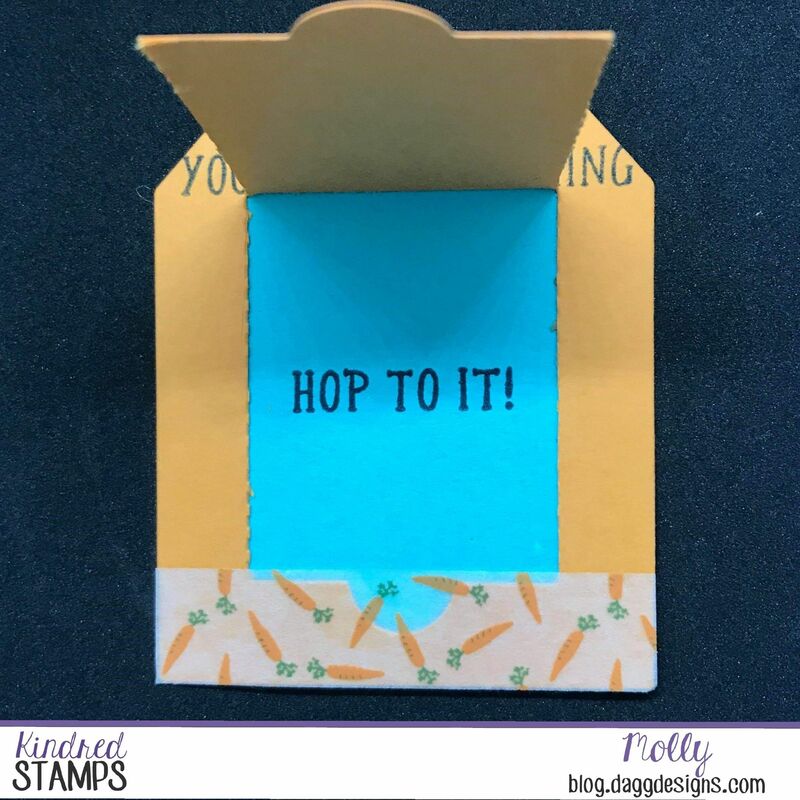 I used a tag die cut with a flap, and hand cut out some plain colored card stock and glued it on the back so I could add my “hop to it” sentiment. This woven ribbon technique was an AMAZING Pinterest find! I included the link below. Essentially you use glue dots for each strand on each end. Once you have three on one side, move onto the next and weave the ribbon in and out (don’t forget those glue dots!). I used some retired Stampin’ Up paper behind the ribbon and stamped sentiment directly on it. I added another set of my furry friends to finish it off! Hopefully you enjoyed my projects, and maybe even learned a new trick! The entire Kindred Stamps November release will be available Friday, November 9th at 8am PST/11am EST. Be sure to check out the Kindred Stamps blog on Friday for the full product release as well as the complete line up of all the Kindred Stamps Design Team projects from release week! 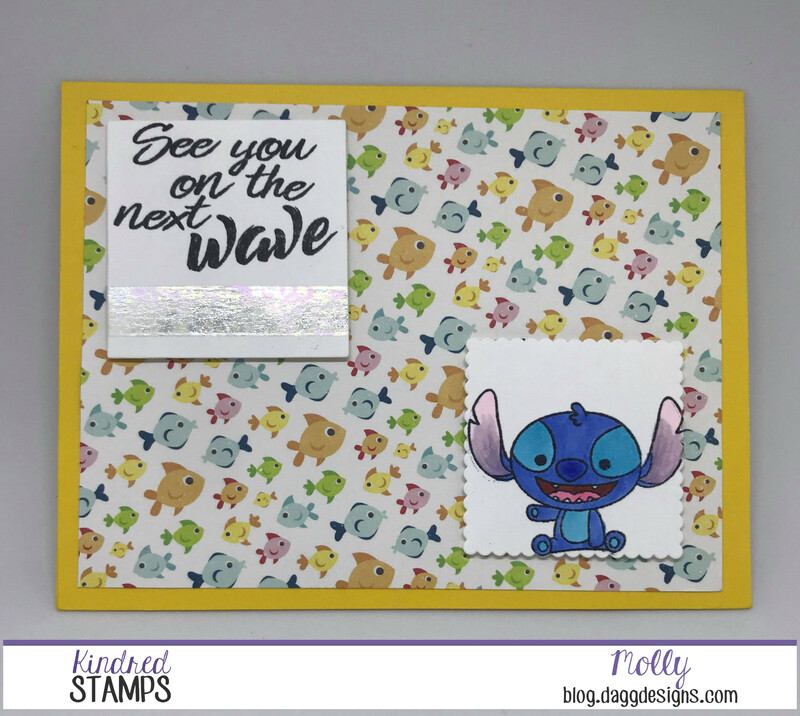 If you visit and comment on all of the designers’ blogs this week, you could win $15 in Kindred Stamps shop credit! So join the Fan Club and release event, show the design team some love, and get ready to empty those wallets this Friday! Ribbon Weaving Card – Stampin’ Up! Guys, this new paper from Kindred Stamps is soooo SWEET. I am going to have to stock up on this paper because there are a ton of stamp sets that go perfectly with these new fun patterns. 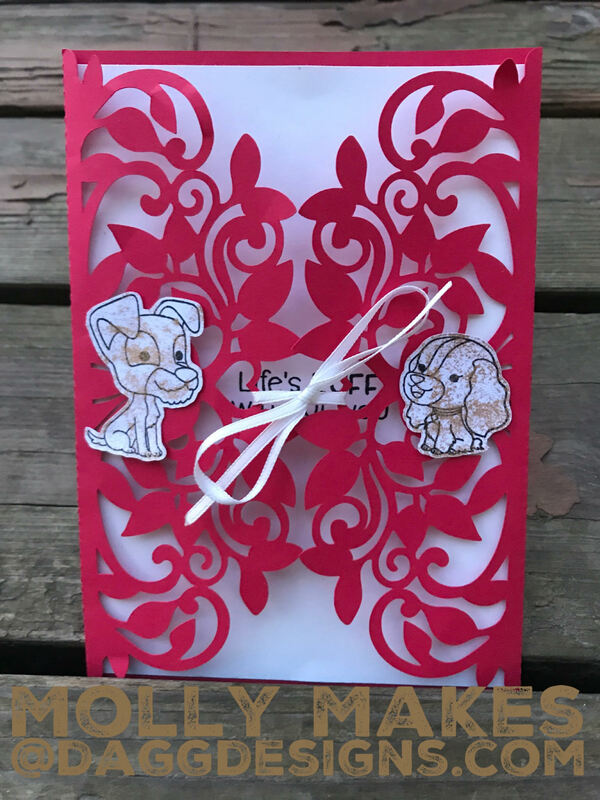 Since the paper has a different pattern on each side the pack is very versatile with lots of options. 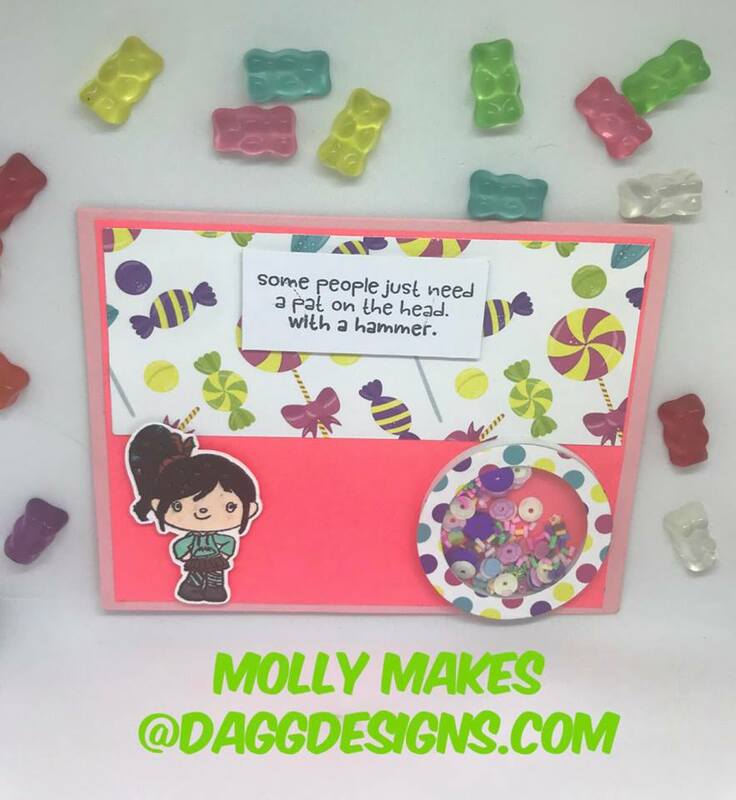 As someone who loves candy, I always enjoy making crafts with the Candy Man stamp set. Its the perfect use for all of my candy themed washi tape, cabochons and die cuts that I don’t use often. Continuing with the candy theme, I decided to make a shaker card using the Arcade Friends set and the Sweet Tooth shaker pack. Lately shaker cards have been my ‘cup of tea’. They are so fun and easy to make once you get the hang of them. Queen and Company have the coolest easiest shaker kits! Have a magical crafty day! Hello crafty friends! Fall is just around the corner meaning so is SCHOOL. I am super excited to share stuff from the Kindred Stamps August release. 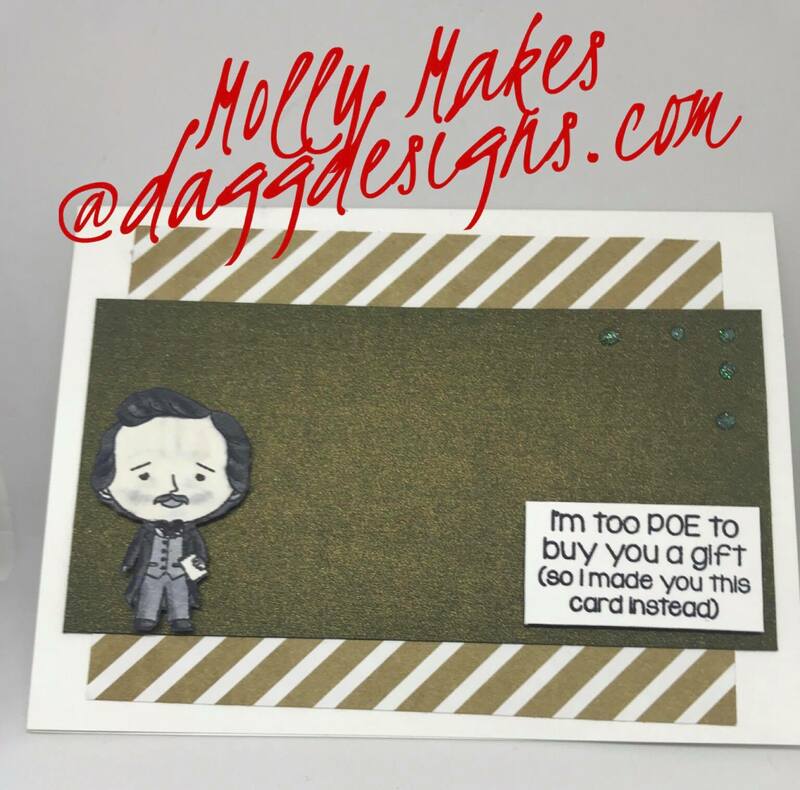 My first card is big nod to the famous gentleman Edgar Allen Poe. The set is called “Raven Mad”. This card was a bit out of my comfort zone as I had the ‘brilliant’ idea to color him in neutral tones to make him look more… historical??? As usual I used dimensionals, dew drops for accent, memento ink for the stamping, copic markers for coloring, Tombo snail tape for my paper adhesive. Finally, you don’t have to search the entire sea to find this set. “Sea Friends” is a set you can’t forget. How do you like my sequins? This is from a Kindred Stamps shaker pack mix that I LOVE. Be sure to check out the release this Friday! We have six new stamp sets, new shaker packs, and a couple new stencils coming out Friday, August 24th at Kindred Stamps, that we think you’ll fall in love with as much as we have! Come join us on our team’s blog hop for a chance to win a $10 store credit; make sure you leave comments on each blog to be entered. Join our Facebook Fan Club to be kept in the loop about giveaways, share your projects, and see all of ours! Hello all! 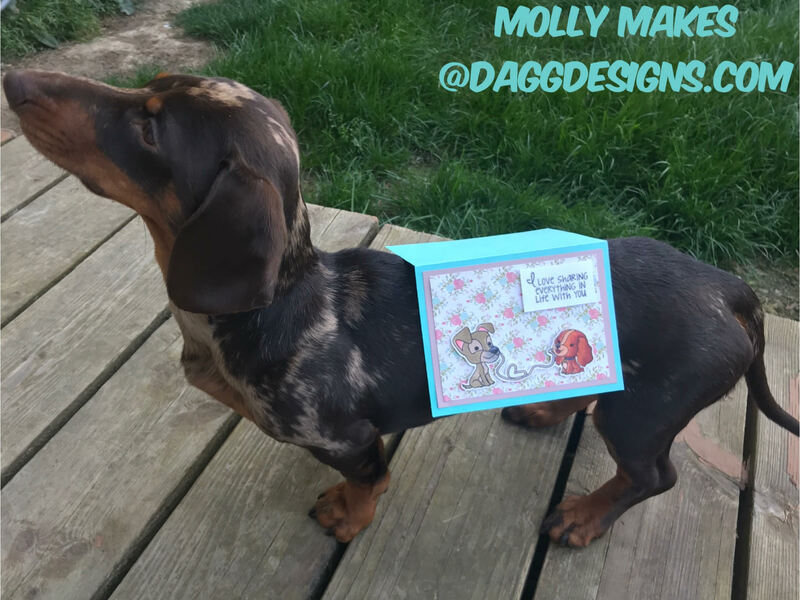 This is Molly from the Kindred Stamps Creative & Design Team. This card really took me back to my childhood of pre cable days in my household! Have you ever been coloring a character or any image for that matter and didn’t have the colors you need? That is exactly what happened to me on this card! Who would have thought that a school bus would need so many yellows?!?! Black memento ink was used for my sentiment and the outlines of the stand and my girl. They were colored in with Copic markers. I was SO EXCITED when I realized my shaker eyes would fit on the bus perfectly. It was the perfect touch to bring the bus to life! Hope you guys have a good school year this year! The Kindred Stamps team, myself included, hope that you’ve enjoyed reading about my card makes for this release. If you would like an opportunity to win shop credit please go and comment on everyone’s blog post! One random winner will win a $10 shop credit, they will be contacted privately and announced in our Fan Club, Kindred Stamps Fan Club! It’s that fun time of year where the sun stays up, a cold drink is refreshing, and there are bright, bold colors everywhere! 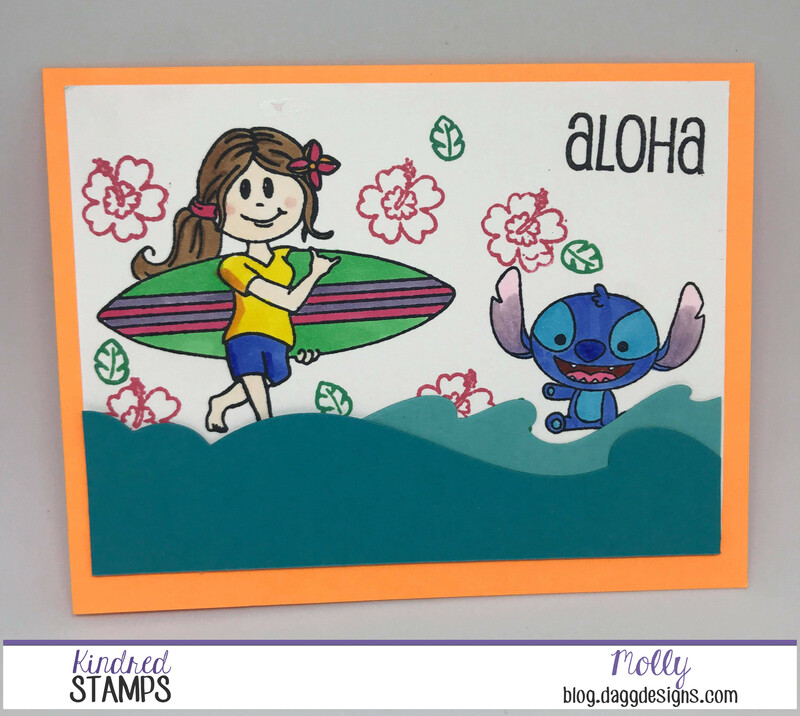 This month for the Kindred Stamps release I get to showcase Lemonade Stand, which obviously screams of summer fun. This card was a fun one to put together. I always keep my paper scraps, I broke out my scraps drawer and found a few fun bright pieces to use, this was a good one to utilize the paper that I have been saving for so long. It makes me feel less like a hoarder and I honestly see it as a fun challenge. I used paper scraps, with snail tape as my adhesive for the background and dimensionals to make my lemonade stand and girl pop! 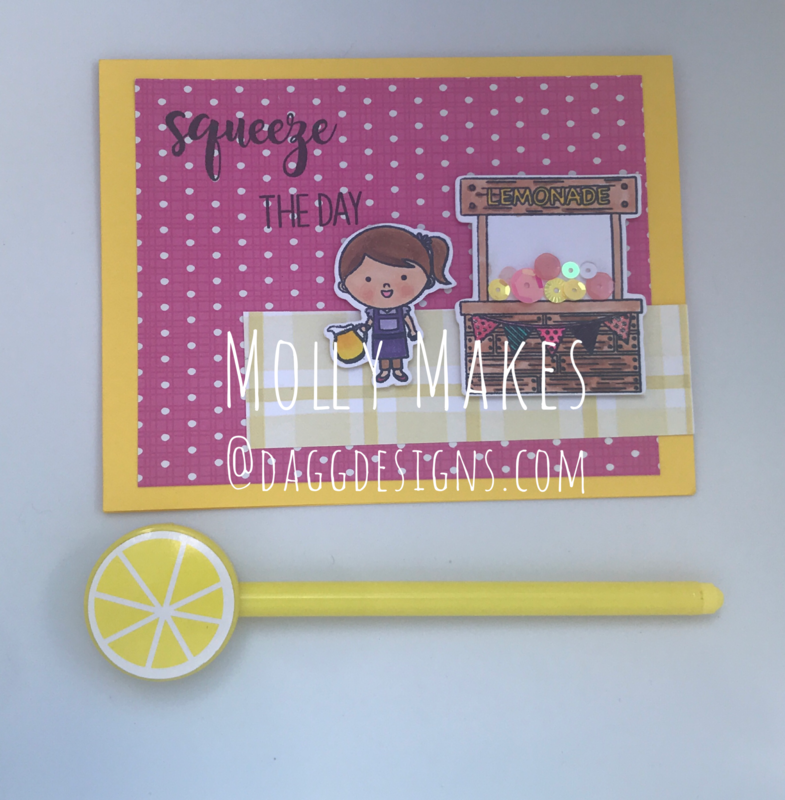 I also used sequins from the Kindred Stamps Pink Lemonade shaker pack and attached them with mini Zots. I felt like the bit of sparkle really brings your eye to this adorable stand. The adorable fruit pen is a bonus with this month’s June stamp bundle (spoiler alert!) 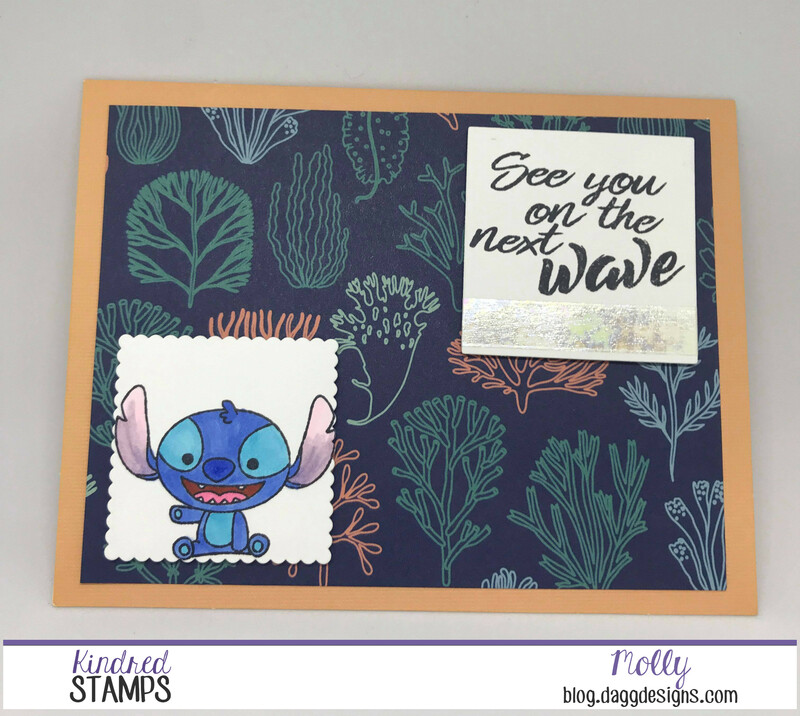 from Kindred Stamps, I loved how it matched my card’s theme and just had to showcase it! My BFF, Rachel Winn, gave me microfiber cloths on our last visit in Seattle for her birthday, and I finally got to bust them out. I use them for cleaning my stamps and boy are they amazing. I also use them to wipe my Misti down when I have missed the stamps partially and make a huge mess. The other sets coming out are so cute and I hope you enjoy them too! As always, make sure you hop along with the blog hop to be entered into the drawing for a $10 store credit. 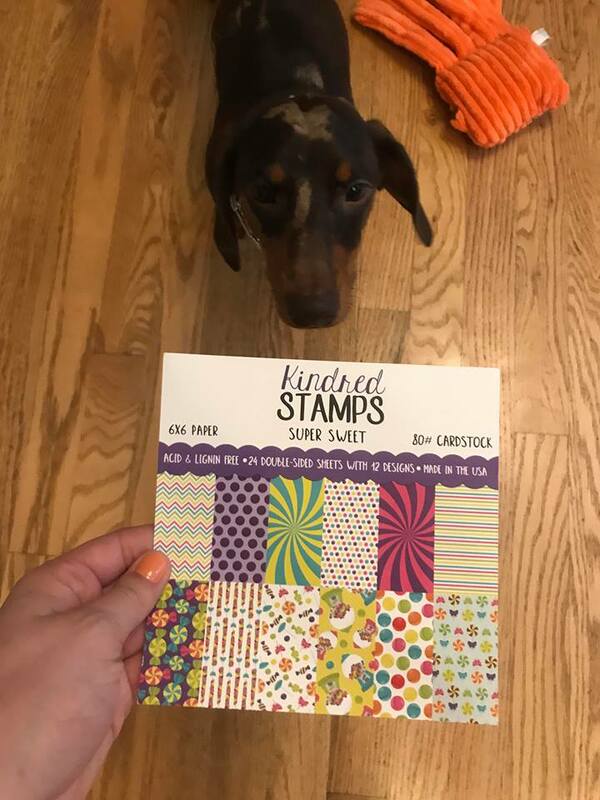 Please come join us at the Kindred Stamps Fan Club to see fun all month long, and share your projects too! 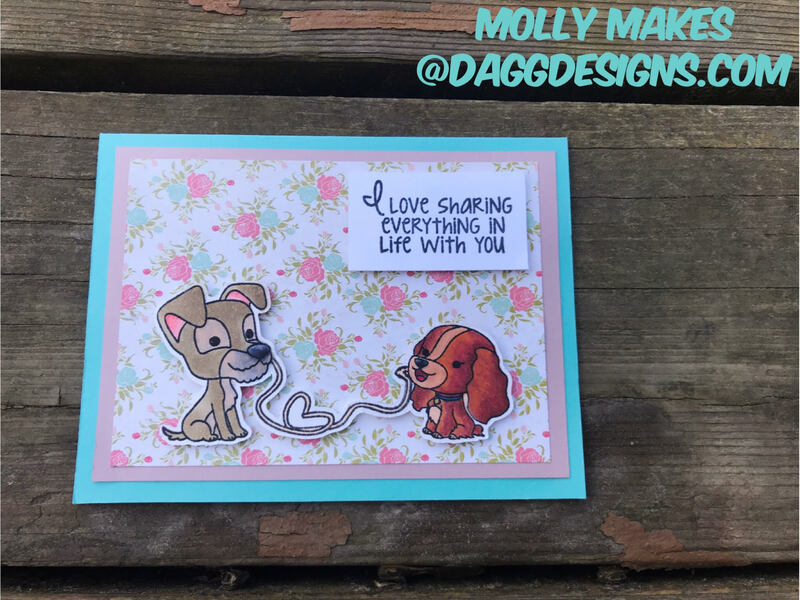 Hello everyone, today I am sharing my cards using Kindred Stamps Puppy Love Stamp Set. This set is releasing this Friday, May 25th. I have a guest on my blog that has yet to be introduced. Her name is Lady and she is our 10 month old Dachshund. Obviously she had to be a part of this post, she IS a PUPPY! I had a challenging time coloring these pups. I have a very limited amount of Copic markers since I am still starting out. The dogs in this set didn’t turn out quite like I had imagined, but I still love them. I paired them with bright patterned paper, then layered it over two solid layers that matched the flowers. I am still second guessing my decision to color the pasta a tan color and not red…. but it looks OK. Also, for the dog on the left, his ink bled on his poor little snout, but he’s a stray and I think it works to make him look a bit ‘grungy’. I popped the sentiment (my favorite, since Evan and I do share everything!) 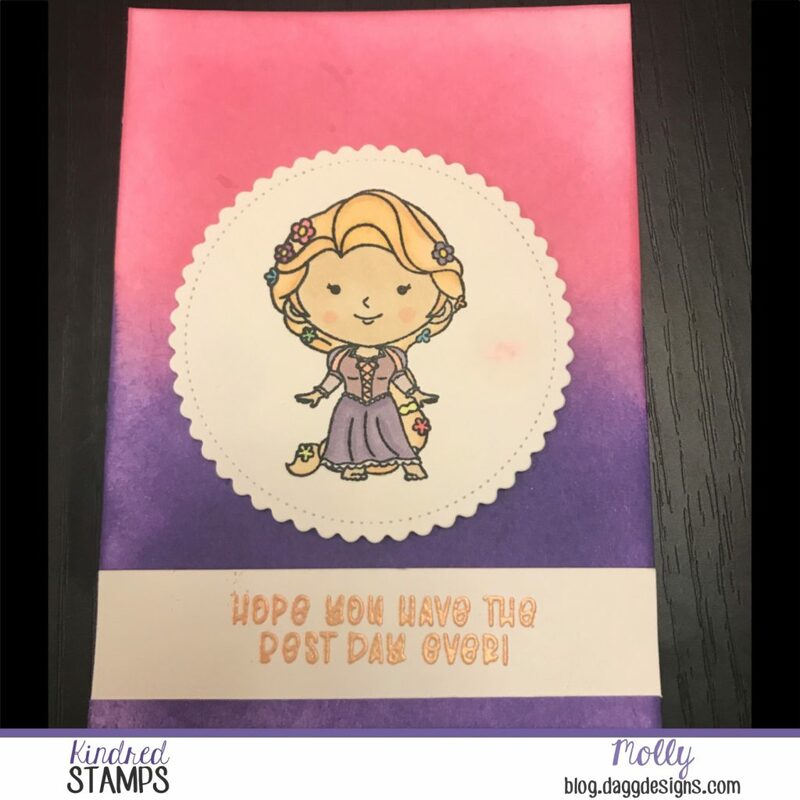 with some Stampin’ Up dimensionals, which are pretty much my favorite tool! I think that Lady did an EXCELLENT job as a model, what do you guys think? For my next card, I cut the base out on my cameo. I have been trying to step out of my box a little bit and this is a very different style than you’ve seen from me so far. I wanted it to look simple and not overwhelming with the base I had cut out so I decided not to color them, but added ‘Glitter Kiss’ by Cosmic Shimmer to my pups. This stuff is super fun, and I’m still learning to use it. I used white ribbon to tie the sides together. On the inside, I chose to use this adorable sentiment, because isn’t that what love is all about? 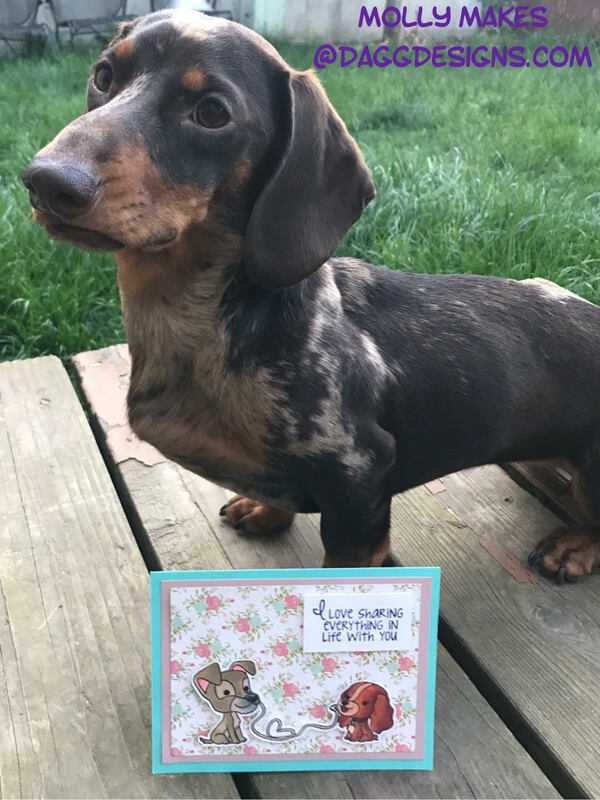 I hope you enjoy my cards! Make sure you check out my teammates’ blogs below and comment on each blog to enter for the chance to win store credit! We are extremely excited about this month’s Kindred Stamps release, and want to invite you to join us on our Facebook event so you can see all of the projects our Creative and Design Teams made to showcase these fun sets! If you take the time to hop along with our team, make sure you leave a comment on each blog to be entered to win a $10 store credit! 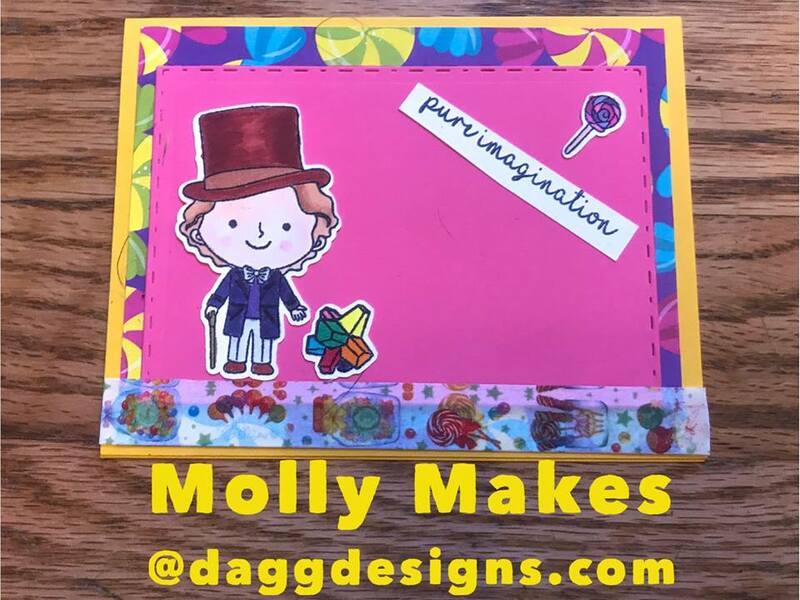 My name is Molly Dagg! 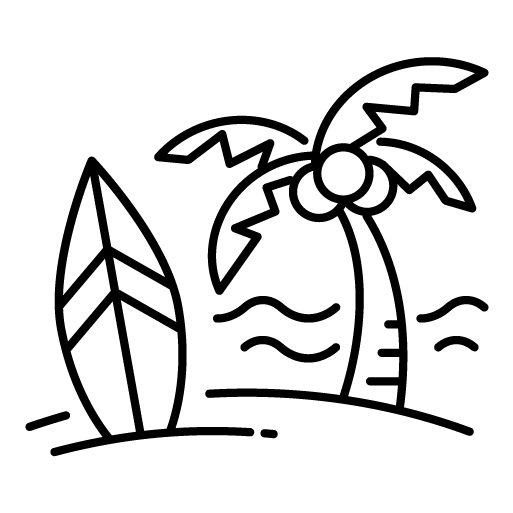 Welcome to my blog about arts & crafts, video games, and whatever else I want to write about!